There’s nothing like one of those plastic toboggan sleds for sliding down a hill of powdery snow. They were often the cheapest option in the store and almost everyone owned one. They were always the first sled that could reach the bottom of the hill and the ride only got faster with each succeeding run. These snow sleds are light, colorful and super fast. Unfortunately, they were also often the first to break. One rock or slightly twisted landing and the sled would crack and the fun was over. Searching Google for the best snow sleds mostly brought up articles about snowmobiles. 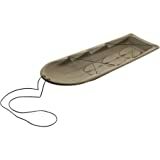 However, it eventually led us to finding another type of sleds that were designed for hunters. They’re certainly not the most colorful sleds, they only come in black. They’re not cool, like the Hammerhead Sleds or the PT Blaster. But, this just might be the only sled you will ever need. And, the entire family can use them. Don’t have a great place to sled near your home. Not to worry, we have a post that will help you build a sledding hill in your own back yard. These heavy-duty sleds are made of high impact polyethylene. They were actually designed for outdoor sportsman to drag heavy items with a snowmobile. They’re made in the USA and have a 2 year warranty. The high sides and super strong construction make it a great family sled. Mom or dad can ride with several children down the sledding hill. If you have a straight sledding run and like to go fast, this just might be the last sled you’ll ever buy. Unless, of course, you need a second or third one. Terrain and Amazon offer two sizes of these utility sleds. Both come with high side walls and a ribbed bottom. The larger model caught our eye when we saw that it had an overall 5-star rating on pretty much every website that sells it. The only complaints we found related to the included tow rope being too flimsy for some uses. It’s easily replaced and there’s even some hitch kits to make it safer to pull behind a snowmobile. Why do we at Cool Outdoor Toys love this snow sled so much? Well, obviously the reviews are great. But, it offers so much more for families than just a winter toy. It’s truly a product to be used year-round. And, if these sleds can stand up to the extreme sledding conditions one might expect to find in Alaska, chances are good it can stand up to your favorite sledding hill. Check out this fun video from “the middle of nowhere in Alaska.” The scenery is gorgeous. The poor little toboggan sled didn’t last long. But, the less-colorful black sled withstood everything they threw at it and clearly provided a great glide down the hills. The sport sled measures 54 x 26 x 9.5 inches and weighs around 12 pounds. But, you will pay almost twice as much for that extra 18 inches. This model is a bit heavy for youngsters to drag up the sledding hill. But, the extra room makes it great for giving several children a ride while taking a walk in the snow. The larger size makes it a great choice for a year-round toy and gardening tool. It’s even sturdy enough and long enough to bring the family Christmas Tree in from the woods. Hitch this sled to the back of a snowmobile and it can carry winter camping gear, firewood, ice fishing gear, hunting gear or food to animals. Think of it as a wheelbarrow for the snowy and icy conditions of winter. Several families mentioned using it to transport ailing dogs to their favorite “spots” or to transport young farm animals that may not be able to navigate through deep snow. And, before we get too far away from snow play, these Terrain snow sleds are great for slipping and sliding down your favorite sledding hill. They are fast sleds on straightaways. Just be mindful of trees and other obstacles like you would with any other snow sled. This season, Amazon was offering a special on the 7 pound Terrain Utility Sled for Prime Members. Several third party vendors also sell them. This snow sled measures 36 inches long, 26 wide and 9 deep. It weighs around 6 pounds – the same as many play sleds. The smaller snow sled weighs about the same as a more traditional plastic sled but can stand up to a lot more abuse without cracking. Most toboggan style plastic play sleds do not mention their weight capacity. One traditional 48 inch plastic toboggan sled listed a weight limit of only 100 pounds. A few sleds, listed as suitable for 2 children OR a “large adult” were only rated for 150 pounds – 45.7 pounds less than the average US adult male and 18.5 pounds less than the average US adult female (according to data from data collected by the CDC from 2011 to 2014). Terrain does not provide weight capacity information. However, their sleds are designed to carry firewood, camping gear, large hay bails and wild game that can easily weigh as much as 300 pounds. A product designed to carry a 300 pound animal and hunting gear is far more likely to stand up to rough and tumble play than one made to only hold 100 or 150 pounds. The irony is that toy sleds can carry prices in excess of what you can purchase this heavy-duty snow sled for. Gardeners love these utility sleds. They’re great for removing yard debris, moving dirt and hauling fall leaves to the curb. They easily slide over grass and dirt. Many reviewers mentioned dragging their sleds over rough terrain and some reported only seeing surface scratches on the bottom of their sleds. Grocery shopping on snowy days? Instead of navigating a slippery sidewalk or driveway with an armful of purchases, you can simply load up the sled and drag it over the ice and snow. They have also proven extremely helpful for families dealing with sick and injured pets; using them as gurneys to transport the animals safely. I could also see one being used as a party pool for your favorite pooch. Throw your umbrellas, beach chairs, water toys, beach blankets, towels and coolers into this heavy-duty sled and make a single trip to your favorite spot on the beach. You’ll also have a great place to keep everything nice and dry. It even floats!